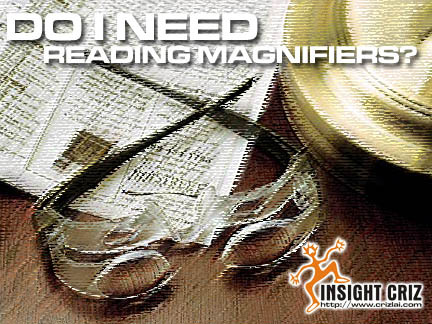 DO I NEED READING MAGNIFIERS? Do I ready need to have at least one reading magnifier in my possession? That is the question I have always asked myself. The answer is yes. It is not that I have poor eyesight or am getting too old to see things clearer. The reason is that nowadays a lot of the labels especially the prescription labels are with such small prints that it strained the eyes just to be able to read them. On top of that, some of the clauses in an agreement are typed so small that it would be risky if you did not read and understand them well prior to signing up. There are many type of reading magnifiers around the market place, ranging from lighted table top magnifiers, hand held magnifiers, pocket magnifiers, to LED illuminated magnifiers for you to choose. Get one today as you might not know when you really need it urgently.